The Tornado GR4 is a variable geometry, two-seat, day or night, all-weather attack aircraft, capable of delivering a wide variety of weapons. The Tornado GR4 is a variable geometry, two-seat, day or night, all-weather attack aircraft capable of delivering a wide variety of weapons. Powered by two Rolls-Royce RB 199 Mk 103 turbofan engines, the GR4 is capable of low-level supersonic flight and can sustain a high subsonic cruise speed. The aircraft can fly automatically at low level using Terrain Following Radar (TFR) when poor weather prevents visual flight. The aircraft is also equipped with Forward Looking InfraRed (FLIR) and is Night Vision Goggle (NVG) compatible. This gives it a relatively unique all weather night capability as well as making it an impressive platform for mounting passive night electro-optical operations. For navigation purposes, the Tornado is equipped with an integrated Global Positioning Inertial Navigation System (GPINS). The GR4 also has a Ground Mapping Radar (GMR) to identify fix-points and update navigation systems as well as providing an air to air search facility. The GR4 is also equipped with a Laser Ranger and Marked Target Seeker (LRMTS) that can be used to locate targets designated on the ground or can provide accurate range information to ground targets. 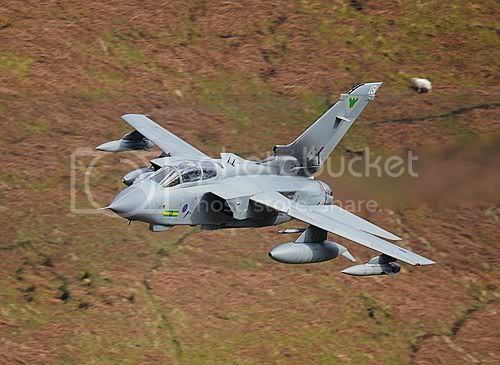 The GR4 typically carries up to a maximum of 5 Paveway IV smart weapons or 2 Stormshadow cruise missiles but can be configured with various weapons, targeting pods and reconnaissance pods simultaneously including the Dual Mode Seeker (DMS) Brimstone, ALARM Mk2 missile, Litening III and the Reconnaissance Airborne Pod TORnado (RAPTOR). The Tornado GR4 is a world leader in the specialised field of all-weather, day and night tactical reconnaissance. The RAPTOR pod is one of the most advanced reconnaissance sensors in the world and greatly increases the effectiveness of the aircraft in the reconnaissance role. Its introduction into service gave the GR4 the ability to transmit real-time, LOng Range Oblique Photography (LOROP) to commanders or to view this in cockpit during a mission. The stand-off range of the sensors also allows the aircraft to remain outside heavily defended areas, thus minimising the aircraft’s exposure to enemy air-defence systems. Additional capability in the Non-Traditional Intelligence Surveillance and Reconnaissance (NTISR) role is provided by the Litening III RD and the use of the ROVER data link for providing tactical operators with real time Full Motion Video (FMV) in the battle space. All GR4 aircraft are capable of carrying the Air Launched Anti-Radiation Missile (ALARM), which homes on to the emitted radiation of enemy radar systems and can be used in the Suppression of Enemy Air Defenses (SEAD) role. The GR4 is capable of carrying up to nine ALARM or a mixed configuration of ALARM and bombs. The self protection capability of the GR4 has recently been upgraded by the integration of the state of the art ASRAAM short range air to air missile. Infra-Red (IR) and Radio Frequency (RF) countermeasures are provided by a BOZ-107 Pod on the right wing to dispense chaff and flares and a Sky Shadow-2 electronic countermeasures pod on the left wing. The aircraft is also equipped with an integral 27mm Mauser cannon capable of firing 1700 rounds per minute. The Tornado GR4 is now equipped with the Storm Shadow missile and 2 variants of the Brimstone missile, including the most advanced DMS variant. The Storm Shadow allows the Tornado to make precision strikes in poor weather with a greatly increased stand-off range from the target area. Whilst legacy Brimstone provides the Tornado with an effective anti-armour weapon coupled with an enhanced stand-off range. The DMS variant enables unrivalled flexibility coupled with precision which is second to none. 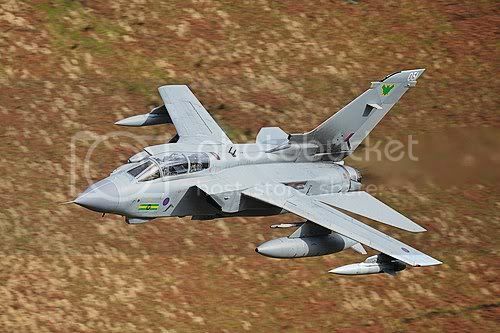 In addition the Tornado GR4 Force trains and maintains a capability with legacy weapons such as 1000lb class dumb weapons, legacy Paveway II and III as well as their enhanced variants and the AIM 9L. 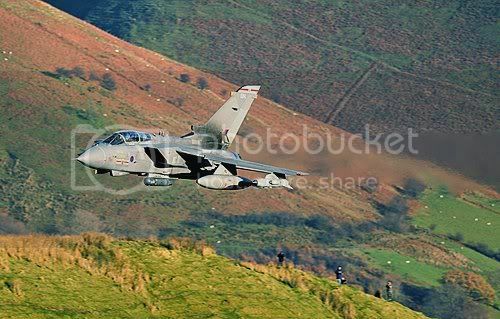 The Tornado GR4 is currently operated from two bases. Based at RAF Lossiemouth, in Scotland, are the Operational Conversion Unit, 15 (Reserve) Squadron, 12 (Bomber) Squadron and 617 Squadron, the “Dambusters”. RAF Marham is the home of the GR4s of II (Army Cooperation) Squadron, IX (Bomber) Squadron and 31 Squadron the “Gold Stars”. 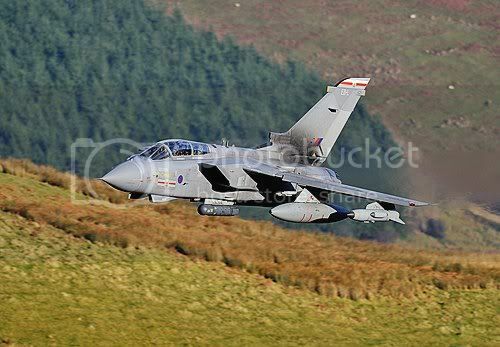 The Tornado GR4 has been successfully deployed in Operational theatres since 1990. It has seen action under various operations in Iraq, Kosovo, Afghanistan and most recently Operation ELLAMY over the skies of Libya in support of the United Nations Security Council Resolution 1970.